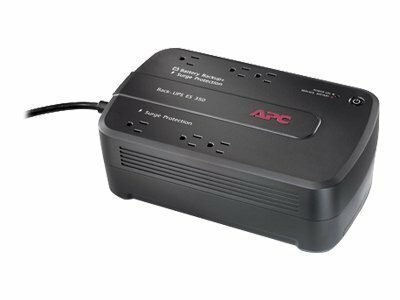 APC Back-UPS ES 350G - UPS - AC 120 V - 200 Watt - 350 VA - 6 output connector(s)Keep your network up and running with the APC Back-UPS 350G.APC's Back-UPS provides enough battery backup power so you can work through short length power outages. It also safeguards your equipment against damaging surges and spikes that travel along utility and phone lines. The Back-UPS series is also "greener" than ever, using an ultra-efficient design that consumes less power during normal operation than any other battery backup in its class, saving you money on your electricity bill. Coupled with all the standard features of the Back-UPS series, the 350 is the perfect unit to protect your productivity from the constant threat of bad power and lost data.The APC Back-UPS 350, 120V, without auto-shutdown software (model BE350G) comes with a battery failure notification feature that provides early-warning fault analysis on batteries enabling timely preventive maintenance. It reserves power capacity and run time for connected equipment that require battery back-up while providing surge only protection for less critical equipment. Additionally, the cold-start capability provides temporary battery power when the utility power is out. The BE350G is hot-swappable and ensures clean, uninterrupted power to protected equipment while batteries are being replaced.